← EGYPT: Are the Army and the People One Hand? 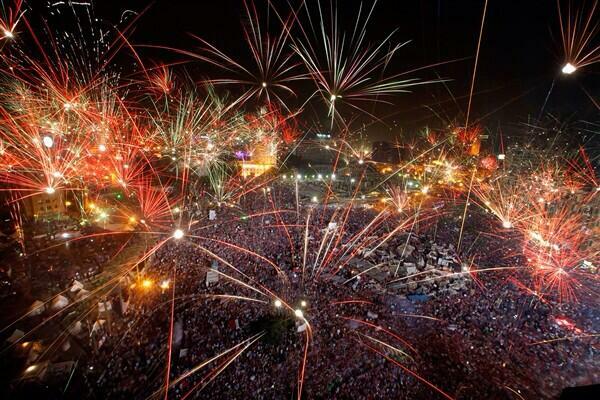 EGYPT: This is What Democracy Looks Like! For the second time since the beginning of the Egyptian Revolution on 25 January 2011, the Supreme Council of the Armed Forces has been able to maintain its leadership position in the Egyptian state by ceding to the demands of the people and ousting an unpopular president. In February 2011, the Egyptian people filled Tahrir Square and many other protest venues throughout Egypt to demand an end to the 30 year Mubarak regime. As those 18 days passed and the people showed their resolve not to be governed in the old way, the Army, with the support of its neo-liberal US backers, refused Murabak’s orders to make war on its own people, as the armies of Qaddafi and Assad would latter do, and instead offered a compromise, democratic elections resulting in a new president, that allowed the Army, the real seat of power in Egypt, to hold on to that power. The US imperialists and neo-liberals of all stripes prefer liberal democracy to dictatorship because while the capitalist still maintain their control, the working masses have a greater buy-in if they feel they have had the opportunity to elected their leadership every four or so years. And while they may demand liberal democracy for themselves, in this region, they have been all too happy to work with dictators like Mubarak, Assad, Qaddafi, Saleh, or Ben Ali….as long as it lasted. Seeing that the Arabs have risen up and will no longer accept that, their hope is to replace these dictatorships with “representative” democracies of the US or European type, bourgeoisie democracies, which have proven to be the most stable form of state for imperialist exploitation. That is because periodic elections are suppose to give the ordinary citizen the illusion that they are really the masters of their own fate. The way it is suppose to work is, say every four years, the people are subjected to a massive dog-n-pony show by the major political parties and the media, from this they select new leaders. Once the leaders get in there, by hook or crook, they are suppose to be free to go back on their promises and the people are suppose to put up with it for four years or until the next dog and pony show of elections. Meanwhile, behind the scenes, it is business as usual with the usual suspects running things. That is why bourgeois democracy is so stable and so preferred by the capitalist class. Because they had the most developed political organization to emerge from Mubarak’s police state conditions, and because Egyptians were in the “anyone but the old regime mode” the Muslim Brotherhood was in a good position to sweep the first elections. Mohamed Morsi barely won the election based on his promise to built an inclusive government. Then he went back on his word. For bourgeois leaders that is Politics 101. The people are suppose to put up with it. To do anything else is to violate the rules of liberal democracy which is actually another from of dictatorship, as we can see in the US. What the Egyptian people did yesterday was an example of real democracy, people’s democracy, the kind that won’t put off the struggle for freedom and justice until the next election. What the Egyptian people did yesterday was to show that the Egyptian Revolution, far from over, as claimed by many a pundit, has only just begun. Posted on July 5, 2013, in North Africa and tagged Egypt, Imperialism. Bookmark the permalink. Leave a comment.